She presented to our school community to Grades 4-8 and then to Grades K-4. I always enjoy an inspiring hero and artist who can inform and bring all those social justice issues that I am passionate about to the forefront with the power of words and books. I am a woman science and mathematics teacher. This book excites me. It encompasses so many issues that I am passionate about. “Counting on Katherine” tells the story of Katherine Johnson and the societal blocks she faced through her life. She faced racism and sexism at every turn yet never stopped believing in herself. This story brings the truth to us about how she improved the world. She is one of the many previously unknown hero’s of my time. During the very “beautiful” and talented Helaine’s presentation, I found myself and the school population, captivated with her presentation. She spoke of so many subjects which excite me. These topics open opportunities and possibilities for the many I educate. Helaine spoke of how she wrote about feminism, racism and suppression. She included topics of mathematics, science, space, and the “power of the pen”. She introduced the dream of writing to many during her amazing and dynamic presentation of her children’s books. Thank you, Helaine for introducing me to another hero. 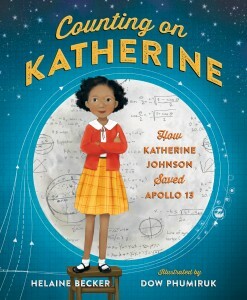 I will now share Katherine Johnson’s story with many for years to come.